RSSC: Social location privacy - what is the fuss? The legendary "what is the fuss" series continues, adding onto Cloud Computing and Virtualization. 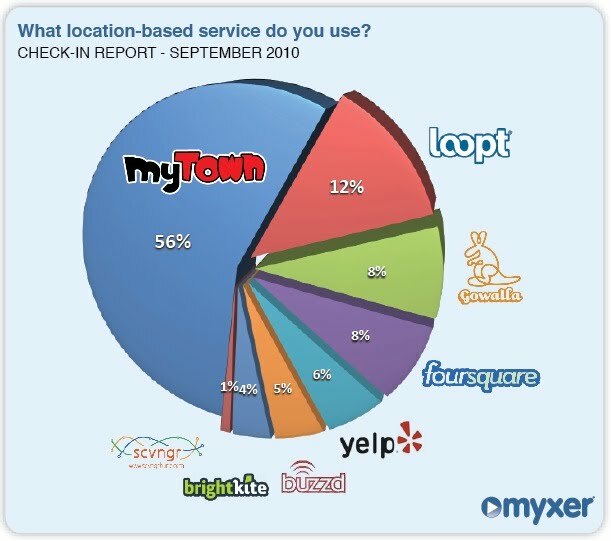 Social media location services are all the rage right now, Foursquare and Gowalla both being established players and the big boys like Facebook trying the me too strategy with Facebook places. In case your cave does not get the Mashable RSS feed, social location services basically provide the ability to "check in" or announce that you are at a specific place. 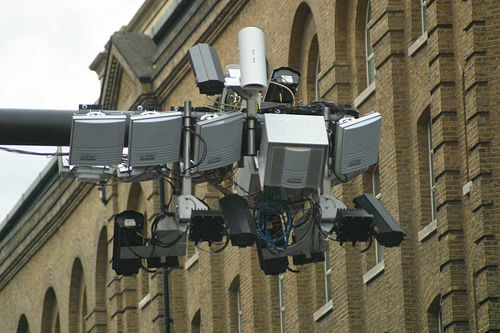 This is done using the GPS ability in your mobile endpoint. 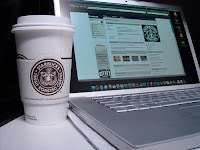 So when you are at that restaurant you love, or doing some bar hopping on a Friday night or working in that Starbucks that makes the perfect Chai soy latte where you sit happily staring at how pretty your Mac Book pro is (yeah it is for those kind of people right now) you can tell everyone you are there. The business can then reward your loyalty (and the free advertising they get to your friends) by offering discounts, vouches, special offers etc. Services currently range from basic: i.e Facebook places where you can just check in essentially and let your friends know, to a bit more advanced: i.e. 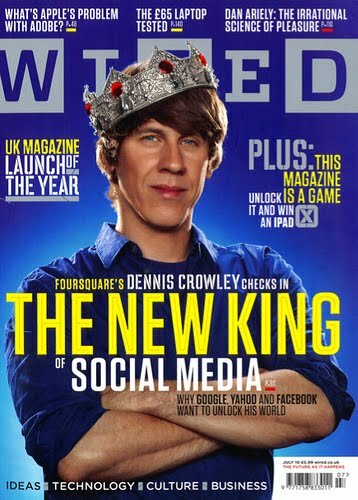 Foursquare, Gowalla where you earn badges for completing various check in activities (e.g. check in 3 times in a day for the traveller badge, or most checkins become "Mayor). And even more advanced e.g. SCVNGR which provides games, treasure hunts, walking and discovery trails etc. 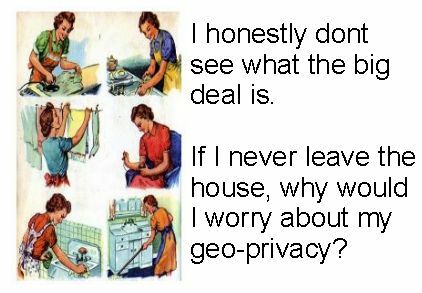 The main issue is the concern with privacy. i.e. suddenly your physical location (and its history i.e. 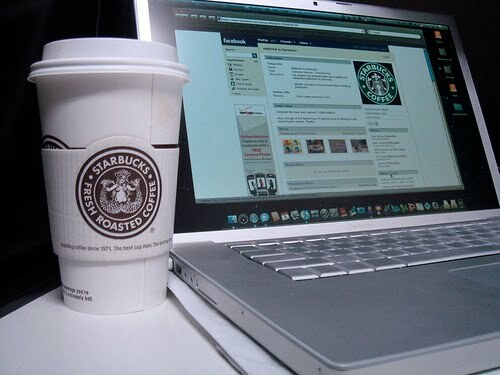 where you have been ) is in a publicly discoverable Internet feed. This has the potential for abuse e.g. typically sighted attacks included robbers realizing your are on holiday, stalking made easier e.g. sites like: http://icanstalku.com/ . Obviously the risk of physical harm to your person and/or your property is quite a scary thought for most people, especially if you are just getting comfortable with putting info on Facebook even with very tight privacy settings, using Twitter etc. If you are in a country or area where ransom and kindnap, home invasions are common place then this is far more amplified. It is also more information on the Internet so a future girlfriend/boyfriend, boss etc could find your that your favourite restaurant has golden arches. Benefits of using social location services? Convenience to share - it is easy to review and comment on the places you like - this is why I use it, rather than typing into Twitter or Facebook: I love River cafe I can just let Checkmate check me in automatically. Simples! You can find friends - it is nice to be able to know that your friends are at Burough market on the same Sunday morning as you and to bump into them for coffee. I have no doubt that social location services reduces your privacy and increases the risk to your person and goods. There is simply no doubt that it increases your attack surface, but you know what it is just the same as when web site cookies first started (remember all those stories about the evils of websites tracking you - who now has cookies disabled? ), crossing the road (actually a pretty big risk), driving (wow a bigger risk), drinking, smoking, going on holiday, you get where I'm going with this? There is virtually no human activity without risk. Everything you do increases your risk, everyone makes decisions virtually every hour on risk for reward, humans do it intuitively - you have a built in risk vs reward function in your brain. So work it out: are do these services currently provide you enough reward for the additional risk? Let me try and convince you they do and you can take some steps to increase your privacy and security. 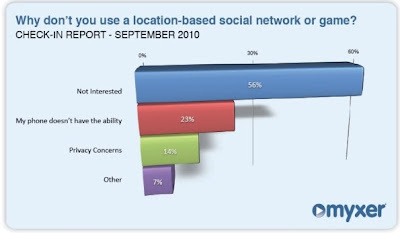 Another interesting insight the data reveals is that the current users of location-based social networking services aren't overly concerned with their privacy, it seems. 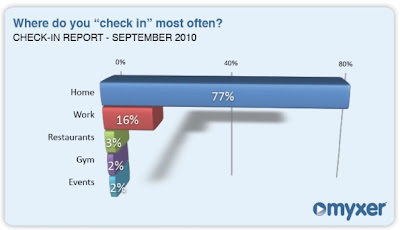 A whopping 77% of the users reported that they check in the most often from their own home. Work, restaurants, the gym and events trailed with 16%, 3%, 2% and 2% respectively as other popular check-in venues. Phone GPS - even without enabling location services your phone is already a built in tracker for you. True you technically need a warrant and/or access to the provider to get this data but it is there. If you have also enabled any other apps that use your location e.g. Google maps at least these services also know where you are and where you have been. Social engineering - OMG its like I can look up your number on the white pages pretending to be your mobile company or your bank and ask you for your postcode for verification!!! WTF? So what is the incremental increase in risk for using social network location services? How sensitive is your location really? Lets examine the FUD that is in Kim Komando's report for USA today. Amazingly it is sighted in two blogs: Jackson Shaw and Kim Cameron. My respect for both of these guys dropped considerably. "....complete stranger who tracked her online..... he pulled out his phone and showed her a photo. It was a picture of Louise that he found online." Is this really just limited to whether you use location services? I mean you could just as easily currently post on Twitter or Facebook (and if you similarly have it publicly available), "hey I'm going to this cool restaurant called: xxxxx". Some stalker guy picks this up, googles you - whala he has your picture (because of course have that publicly available also). So yes fair enough there is greater risk if you have geotagging on your tweet which allows said stalker to pickup things like tweets near you. But the mitigations I discuss below will reduce this risk. "Unless you have a stalker, these services aren't particularly dangerous on their own"
"Location services pose huge security risks"
"Let's say you post a photo of your new house to a photo site. The photo is geotagged. You've linked your photo account to Facebook. 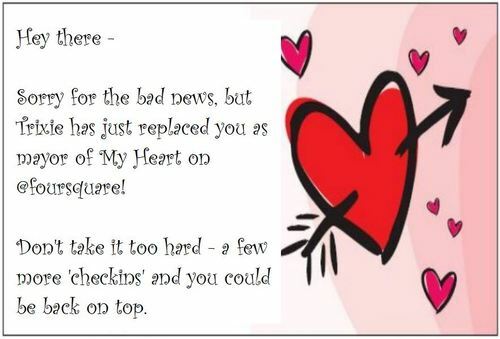 And you use Foursquare or Twitter on the go; updates are sent to your Facebook account. One night you go to the movies. You send a tweet as you wait in line. When you get home, you discover you've been robbed. The burglar used your photo to find your address. He learned more about you on Facebook. Your tweet tipped him off to your location. Thanks to a movie site, he knew exactly how long the movie ran. He scoped out your house and neighbourhood on Google Street View. 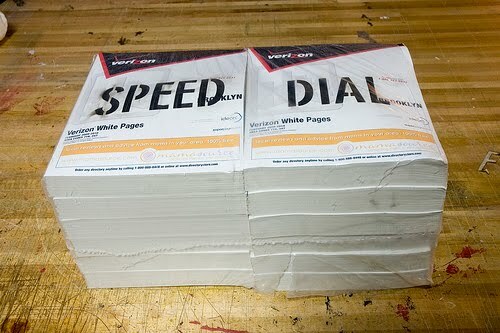 He devised a plan to get in and out fast and undetected." For a lot more balanced article read Can I Stalk You? 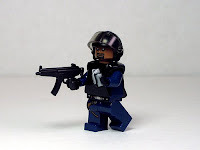 : An Intro to Location-Based Service Security http://bit.ly/ddO6pk (don't worry about the title). Also have a read of this: Robbers used Facebook status update to see if the user was home. Again highlights that the incremental risk is not isolated to Location based services. If you do not protect your Tweets, Facebook status updates etc then the risk of getting your house robbed still applies. Turn off geolocation features in services like Twitter, Flikr, iPhone etc especially if you are going to post pictures of your house, work etc and not just cool cats and Friday night escapades at the local watering hole. You can also turn off geolocation on your phone or only enable it for applications that need it (e.g. Google maps probably needs your location, HD screensaver application probably doesn't). Personal protection - If you have to do one of these things take some personal protection - learn some basic self defence, pepper spray?, gun? (if you are American its your 2nd amendment right you know! ), taser? Security - I have not looked into this in detail but all services provide authentication and authorization. Most support transport encryption and I really hope they either encrypt the data in storage and backup or at least have strong access controls to this data. One think you can bet on a major security incident at one of these companies will = bankruptcy, so it is in their best interests to protect your data. Also it is their competitive advantage, their crown jewels, the data is what they will earn money from so if they don't protect it they are crazy. Also being new companies they will most likely have security built in from the ground up and not be shackled by legacy systems and programs i.e. Chrome vs. Microsoft Windows. I hope this article has at least made you think about social location services. As I said earlier if you don't like revealing anything about yourself and you are consistent in that application e.g. 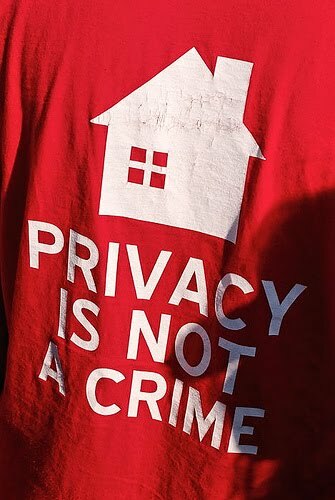 you have a unlisted telephone number and address and you don't carry a mobile phone, don't use Facebook or Twitter - continue on your Hermit ways and do not use social location services. Everyone else I'll see you online and checked-in.